A slumping slugger hits a bomb and a pitcher with 7 plus ERA finds his stuff. Such was the lot of the Dawn Jogger today when she attended her first game at Citi Field, watching the Giants lose to the Mets, 2 to 5. She’d gone to the game with a New York-based Giants friend, who is good friends with the male DJs’ good friend David. 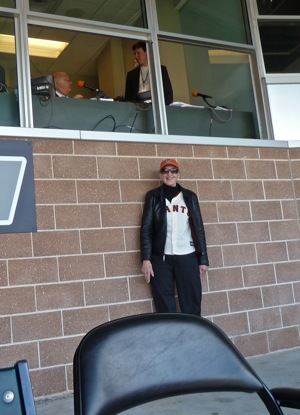 It’s fun to see a game with a real, knowledgeable fan, and there were quite a few other Giants boosters in attendance. 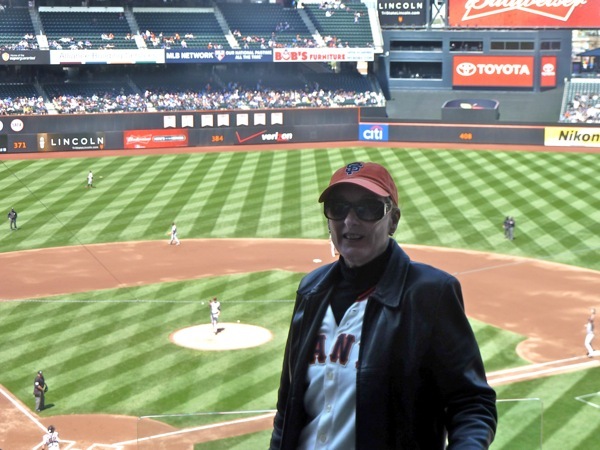 Together the put up with a chilly, cool wind – she hears gusts up to 35 mph – giving the new stadium a Candlestick like feel, complete with blowing hot dog wrappers. Just one row removed, they had the exact same view as Giants radio broadcasters Jon Miller and Dave Fleming, meaning that they couldn’t see any better who was warming up in the bullpen than the play-by-play announcers. This entry was posted in On the road, SF Giants. Bookmark the permalink.